Current nutritional approaches to metabolism syndrome and type 2 diabetes generally rely on reductions in dietary fat. The success of such approaches has been limited and therapy more generally relies on pharmacology. The argument is made that a re-evaluation of the role of carbohydrate restriction, the historical and intuitive approach to the problem, may provide an alternative and possibly superior dietary strategy. 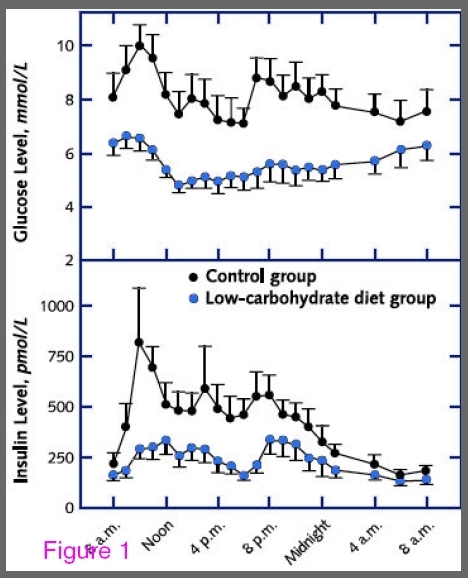 The rationale is based on the accepted idea that carbohydrate restriction improves glycemic control and reduces insulin fluctuations which are primary targets. Experiments are summarized showing that carbohydrate-restricted diets are at least as effective for weight loss as low-fat diets and that substitution of fat for carbohydrate is generally beneficial for risk of cardiovascular disease. These positive effects of carbohydrate restriction do not require weight loss. Finally, the point is re-iterated that carbohydrate restriction improves all of the features of metabolic syndrome. control, strategies based on reduction of dietary carbohydrate have received little support. of the underlying biochemistry and available clinical data. nutritional therapy and reduces insulin fluctuations. syndrome and thereby for the prevention of diabetes. a mean decrease in HbA1c from 7.4 % to 6.3 %. 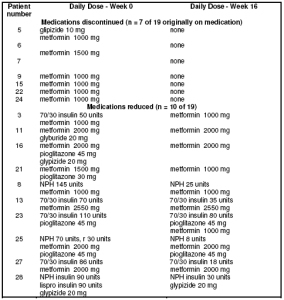 Reduction or elimination of medication. A striking effect of carbohydrate restriction is reduction or elimination of medication. diabetes reduced or discontinued diabetes medication upon carbohydrate restriction. the low-carbohydrate diet compared with the high carbohydrate diet as shown in Figure 2. The diet-heart hypothesis states that dietary fat, or at least saturated fat, promotes CVD. has seriously challenged many of the underlying assumptions of the hypothesis [28-33]. and dramatically, the Women’s Health Initiative . in TG due to carbohydrate restriction. coronary atherosclerosis; greater carbohydrate intake was linked to increased progression. control element determining the fate of ingested lipid is overriding. carbohydrate group had a 3-fold higher intake of dietary SFA . hypertension, termed metabolic syndrome (MetS) suggests a common underlying cause. intolerance that characterizes frank diabetes. insulin-resistant men compared to a similar group of insulin-sensitive controls. Carbohydrate-induced atherogenic dyslipidemia is thus enhanced by insulin resistance. for which there is no known effective drug, its potential should be vigorously explored. parallel effects of hyperinsulinemia and/or hyperglycemia. 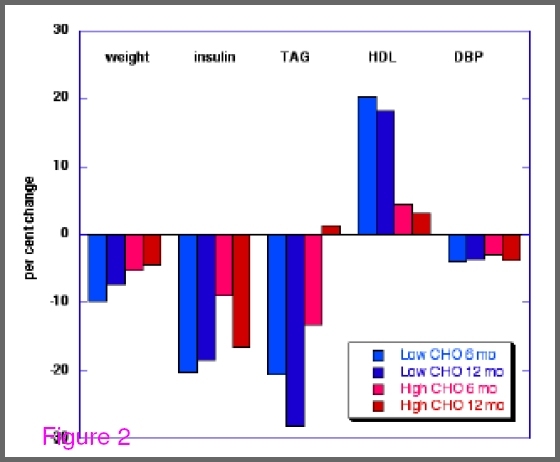 improvements in triglycerides and HDL cholesterol with minimal change in body mass. 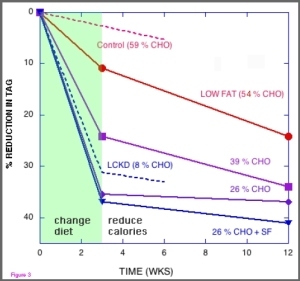 eucaloric low fat plus weight loss. of carbohydrate, but rather the sum of carbohydrate and protein. appropriate than unqualified rejection of low-carbohydrate diets. encourage conformance to the best therapies. suggests that carbohydrate restriction is a common clinical recommendation for diabetes. they have nothing to declare. correspondence with the other authors who modified and approved the final version. Interventions for Diabetes–2007. Diabetes Care 2007, 30(Suppl 1):S48-S65. Interventions for Diabetes–2008. Diabetes Care 2008, 31(Suppl 1):S61-S78. nutritional approaches to the treatment and prevention of diabetes mellitus. Nutr Metab Cardiovasc Dis 2004, 14(6):373-394.
p85alpha: the two sides of a coin. Diabetes 2006, 55(8):2392-2397. 5. Reusch JE, Draznin BB: Atherosclerosis in diabetes and insulin resistance. Diabetes Obes Metab 2007, 9(4):455-463. 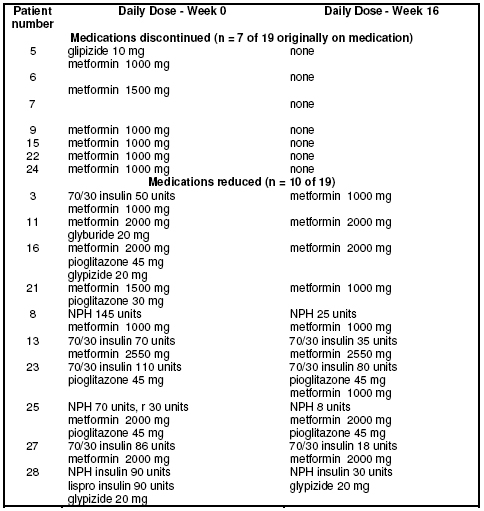 Normal Blood Sugars: Little, Brown and Company; 2007.
clinical experience–a brief report. Ups J Med Sci 2005, 110(3):267-273.
obese patients with type 2 diabetes. Ann Intern Med 2005, 142(6):403-411.
diabetic subjects. Mol Cell Biochem 2007.
improvement of bodyweight and glycaemic control during 22 months followup. Nutr Metab (Lond) 2006, 3(1):22.
glycogenolysis. J Clin Endocrinol Metab 2004, 89(12):6193-6197.
weight loss by modification of diet composition. Nutr Metab (Lond) 2006, 3:16. Experience of a Carbohydrate-Restricted Diet: Effect on Diabetes Mellitus. Metabolic Syndrome and Related Disorders 2003, 1:233-237. Syndrome and Related Disorders 2003, 1(3):239-243.
with non-insulin dependent diabetes mellitus. Nutr Rev 1986, 44(2):65-73.
and bodyweight: low-carbohydrate diet in type 2 diabetes–a brief report. Ups J Med Sci 2005, 110(1):69-73. 21. Eades MR, Eades MD: Protein Power. New York: Bantam Books; 1996. Loss Diets. Metabolic Syndrome and Related Disorders 2003, 1:209-219.
energy restriction: a meta-regression 1. Am J Clin Nutr 2006, 83(2):260-274.
to carbohydrate restriction. Nutr Metab (Lond) 2005, 2:31. J Clin Nutr 2007, 86(2):276-284.
diet for obesity. N Engl J Med 2003, 348(21):2082-2090.
diet in severe obesity. N Engl J Med 2003, 348(21):2074-2081. 28. Colpo A: The Great Cholesterol Con: Lulu Press; 2006. Cardiovascular Risk. Current Cardiovascular Risk Reports 2008, 2(2):88-94. 32. Taubes G: Good Calories, Bad Calories. New York: Alfred A. Knopf; 2007.
carbohydrate diet. Nutr Metab (Lond) 2005, 2:21. 34. Keys A: Coronary heart disease in seven countries. 1970, 41 (Suppl):1-211.
subclass patterns and lipoprotein response to a reduced-fat diet in men. increased risk of cardiovascular disease? Am J Cardiol 2005, 96(3):399-404.
of the thirty-person/ten-country panel. J Intern Med 2006, 259(3):247-258.
diets. J Nutr 2005, 135(6):1339-1342.
syndrome. Curr Opin Lipidol 2003, 14(1):15-19.
acids in cardiovascular disease. J Clin Epidemiol 1998, 51(6):443-460.
women. N Engl J Med 1997, 337(21):1491-1499.
plasma fatty acid composition in humans. J Nutr 2001, 131(2):231-234.
lipids and weight loss. Nutr Metab (Lond) 2007, 4(23). Natl Acad Sci U S A 2007, 104(31):12587-12594.
pathophysiology and molecular mechanisms. Nutr Rev 2007, 65(6):S13-S23. resistance. Ann N Y Acad Sci 2002, 967:52-65. 55. Lustig RH: Childhood obesity: behavioral aberration or biochemical drive? disease in normal-weight men. J Nutr 2002, 132(7):1879-1885.
dyslipidemia even in the absence of weight loss. Nutr Metab (Lond) 2006, 3:24.
dyslipidemia. Am J Clin Nutr 2006, 83(5):1025-1031. 59. Agatston A: The South Beach Diet. New York: Random House; 2003. 60. Atkins RC: Dr. Atkins’ New Diet Revolution. New York: Avon Books; 2002.
overweight men and women. 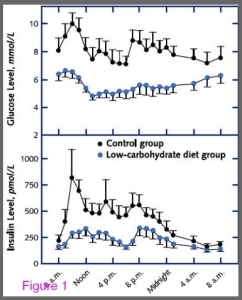 Nutr Metab (Lond) 2004, 1(1):13.
high-carbohydrate diet (control) and after 2 weeks) on a low-carbohydrate diet. diet. Figure redrawn from Boden, et al. . 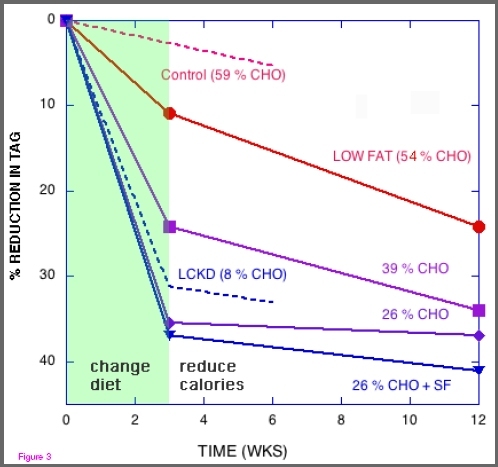 Figure 2 – Comparison of low and high carbohydrate diets at 6 and 12 months. their Table 2 and per cent of baseline was calculated. reduced at diet initiation. Data from Yancy, et al..